One thing that people don't even tend to think about when it comes to any kind of non-white history is the idea that other cultures had different ways to express sexuality and gender. One black man, Mikael Owunna, wrote an amazing and fascinating piece involving this and resistance to white colonialism. And Nzinga’s behavior “was not some personal idiosyncrasy but was based on beliefs that recognized gender as situational and symbolic as much as a personal, innate characteristic of the individual” ( Boy Wives and Female Husbands, 2). 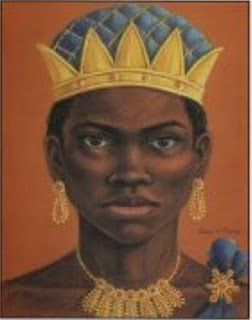 Effectively, as ngola, or “king,” Nzinga’s gender expression reflected that position in her society, and this was not unusual since gender was also seen as situational and symbolic. So much about Nzinga is badass and generally interesting. I highly recommend reading the whole thing, and then if you're white and cis like me, spend some time thinking on how different things could be if our entire view on humanity wasn't based on the white, Western, cishet version that's been forced onto all of us because that's who won. By which I mean, that's who murdered and lied and cheated their way to the top for now.